Day 73: Saturday, July 27, 2013. Ninilchik, Alaska to Homer, Alaska. Baycrest RV Park Site 44. 35 miles traveled. Foggy skies greeted us as we drove south to Homer, Alaska, our next destination on the Kenai Peninsula. We had chosen a campground for its spectacular views from a bluff overlooking Kachemak Bay. 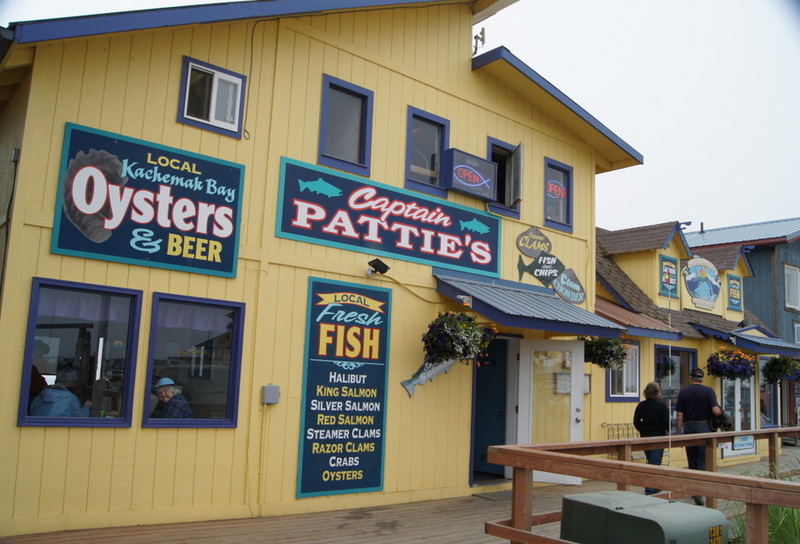 The fog was so thick we couldn’t see anything so we drove to the Homer spit for some lunch at Captain Pattie’s. The Homer spit is a long, narrow piece of land with several campgrounds, a small boat harbor, and many restaurants, shops, and bars. Tourists were everywhere on this Saturday afternoon and parking spaces were rare but we found a spot in front of the restaurant and enjoyed a lunch of halibut and clam chowder. After a stop at Safeway for some much needed groceries we spent the rest of the afternoon enjoying our view from the campground. Several eagles were soaring over the bluffs. It doesn’t get much better than this. The fog rolled in over the water early in the morning. It was eerie looking down over the fog. After a home cooked breakfast of sourdough french toast and reindeer sausage we took a drive to Anchor Point, the western most point reached by highway in North America. We stopped at the beach to watch the tractors bring in boats from the water like in Ninilchik. It was so foggy the tractors beeped to help the boats find them. From Anchor Point we took a drive on the North Fork Loop Road where we saw hillsides covered with fireweed and views of two volcanoes. Bringing in another boat. It was so foggy we couldn’t even see the water. We dropped Blondie off at the RV and took a drive down to the spit. We stopped at the Baycrest Overlook where we could see our campground. As we drove along the road a bald eagle was flying at eye level over the beach close to my window. He stayed beside us for a while. What a treat. As the former owners of several boats named Salty Dawg, we had to stop at the Salty Dawg Saloon for a beer. We finished our tour of the Homer area with a stop at the small boat harbor. No dawgs allowed at the Salty Dawg Saloon. We went in anyway. Henry had just built a fire when Ted and Ruth Ann arrived from Ninilchik. They had been on a halibut fishing trip in the morning and were pretty exhausted after each catching their limit. We visited with them and some campers from Missouri while watching more eagles and enjoying our fabulous views. Haven’t been to a lot of places in Alaska you guys have been to! But I have driven to Homer and the Westernmost Point! Did you see Tom Bodet there? He is from Homer, but alas, there is no Motel 6 in Homer…..
Isn’t the Spit in Homer great? All the shops and food, then the rocky beach just behind the buildings and a great view of the ocean! Hope you guys are having fun there!